UPDATE: Twitter has been helpful to my search, connecting with realtors and community members. Mary Keller has also been recommended to me as someone who knows her stuff! 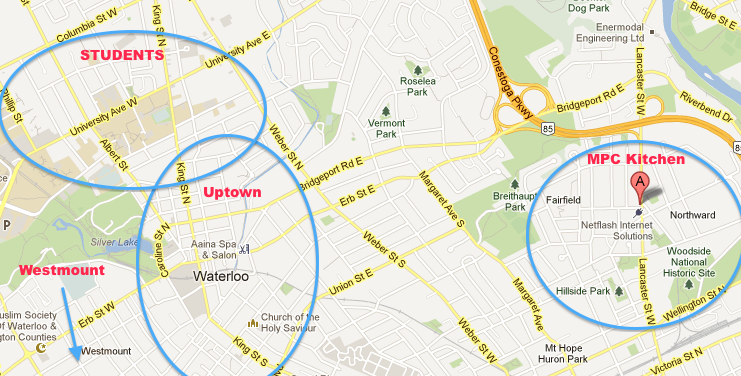 Found this interactive Map of Waterloo… could be useful. It has a drop down menu top left to find and write on the map! Right now we are in the very early stages of apartment hunting in Waterloo. So far, while I have found Craigslist extremely helpful in the Toronto house hunt, apparently Waterloosians are lovers of Kijiji.com – subtle differences that can really make the search a LOT harder. We’re looking for a house rental, probably semi detached or a townhouse. We want somewhere that can serve as a starter family home because who can afford a down payment on your own home after 4 years of university!? Don’t you just hate those people. Anyway, I thought sharing my housing hunt would be helpful for those moving to Waterloo without a clear idea of what area’s are cool and how to get there. Hopefully my mistakes help minimize yours! Essentially: Uptown is walking distance to the restaurants + shops but it’s expensive. The students area can be quite rowdy but the area is more affordable. Westmount is fancy for wealthy older families. So, let the search begin!